As I hinted in Part 1, I'm not really a big fan of modern Transformers designs and engineering--I find these new toys to be too fiddly and complex for my old-school tastes. But when I saw pictures and video reviews of the Transformers Prime First Edition Voyager Class Optimus Prime, I was a bit intrigued: first, it seemed like a solid, good-looking toy; second, I've always been a pretty big Optimus Prime fan. I remember seeing the figure offered in toy stores here for 300 HKD (around 1,700 pesos) back in December, but knowing that it's cheaper in Manila (where it was selling for around 1,500 pesos), I decided that the price is too much for something I did not really like. When I saw the same toy being offered at a toy store in Wan Chai for 200 HKD in January, however, I did not hesitate to buy one. 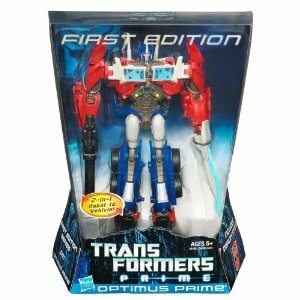 I knew that there was an abnormal demand for this and other Transformers Prime First Edition figures in several countries, including the US and UK, because of Hasbro's decision to stop selling particular figures such as Optimus Prime in these markets. So the first thing I did when I got home was check how much First Edition Optimus Prime cost on eBay: several sellers were offering it for 60 USD and up, excluding shipping, which was more than twice the retail price for the figure. So just for kicks, I resisted opening my new toy, took a picture of it, and put it up on eBay with a starting bid of 49 USD and a "buy it now" price of 59 USD. It sold within three hours. The next day, I went back to the store and bought six Optimus Primes. I posted them all on eBay at the same time, and in three days they all sold at prices ranging from 60 to 68 USD. I had been doing this for the past two and a half months: replenishing my stock, listing them on eBay, and shipping items, all during my free time. At first I was one of the few non-Canadians who was doing his (for some reason, Hasbro decided not to discontinue the figures in Canada), but eventually other sellers from Hong Kong, Malaysia, and even the Philippines started doing the same thing. But even as the additional supply momentarily brought prices down, selling these figures on eBay remained sufficiently profitable. And with that last lot that I've sold a few days ago, I've managed to earn around 50,000 pesos in profit in less than three months. This is what I was talking about, something any of you can do to earn a few thousand extra pesos. On my last trip to Manila in March, the Transformers Prime First Edition Voyager Class Optimus Prime figure was still available at retail, and I'm pretty sure that it still is now. And while the demand for the figures might persist (eBay prices have gone up again to at least 65 USD per figure), supply is dwindling fast (production of the entire line has already been discontinued worldwide, and I'm guessing that the Philippines has some of the last figures at retail) so this may be your last chance to exploit this opportunity and become an arbitrageur. Arbitrage: Exploiting violations in "The Law of One Price"
According to The Law of One Price, all identical items should have the same price in all markets where the items are available. A violation of this law presents an opportunity to profit at zero risk--an arbitrage. Hasbro deciding to halt the sale of the figures only in select markets like the US and UK. The unified selling platform that is eBay and Paypal. Without this platform, it would not be possible for sellers to exploit the price differences. The key in profiting from this opportunity is, of course, information--the knowledge that an exploitable price difference exists. With regard to dealing toy collectibles, relevant information could come from several sources: pricing and availability information from brick and mortar toy stores and online auction platforms in "source" countries (e.g., Yahoo! Auctions Hong Kong and Japan); demand information from special-interest Internet forums and communities (where I found out about Hasbro's decision) and eBay. To end, I would like to share one very interesting point that I have learned from this experience: information is a necessary but insufficient condition for exploiting arbitrage opportunities; if it were all that's needed, then enough sellers would have flooded eBay with Transformers Prime First Edition toys soon after the Hasbro story broke out in January until profits have become low enough to make selling the toys not worth one's while. But like I said (and as you'll see if you check eBay prices now), the opportunity to profit and profit substantially is still there today. I've noticed that despite the availability of information to a sizable number of people--despite the clear opportunity to profit from the situation--for some reason people were unwilling to act on the opportunity at all.